EJM Investigations does not currently offer a training course for private investigation or process serving. However, there are numerous training providers offering such courses. The advice of our experienced private detectives is to attend a course provided by one of the trade associations, such as the ABI (https://www.theabi.org.uk/abi-academy or the IPI (https://www.ipitraining.org.uk/). There are a lot of fraudulent training providers out there, offering guaranteed income and work opportunities. The advice of EJM Investigations is to stick to a reputable provider and don't be swayed by promises which cant possibly be kept. On 31 July 2013 the Home Secretary announced the Government’s intention for the SIA to regulate private investigation activities. This will affect both those in the business and those hoping to enter it, ensuring a minimum set of standards. This Level 3 course will provide in-depth knowledge on how to research information from various sources, gather information through interviews and provide an overview of how surveillance operations (both overt and covert) can assist in gathering information to support an investigation and how that information can be used. You will enhance your private detective skills in preparing for and in presenting the findings of investigations to various clients. Any investigation conducted must be done in accordance with the law and in accordance with best practice guidelines. You will learn how to collate and corroborate evidence for Criminal and Civil investigations and the key differences of what is and isn’t acceptable in each case. Most providers now offer the option of online learning and the cost of such courses is usually relatively cheap. £300-£500 is quite common. The advantage of such courses is that you can learn at your own pace, and have the support of a tutor, who is often an experienced private detective or process server themselves. This type of course aims to enhance the operators ability and skills in navigation, radio commentary, reporting skills and memory techniques. 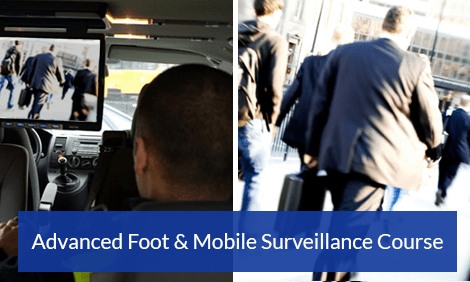 A technical surveillance course is also available for those wishing to further their professional development and gives operators more confidence with the range of hi tech equipment you will come into contact with as an investigator.